is our onsite flower farm, which grows beautiful seasonal blooms and foliage! 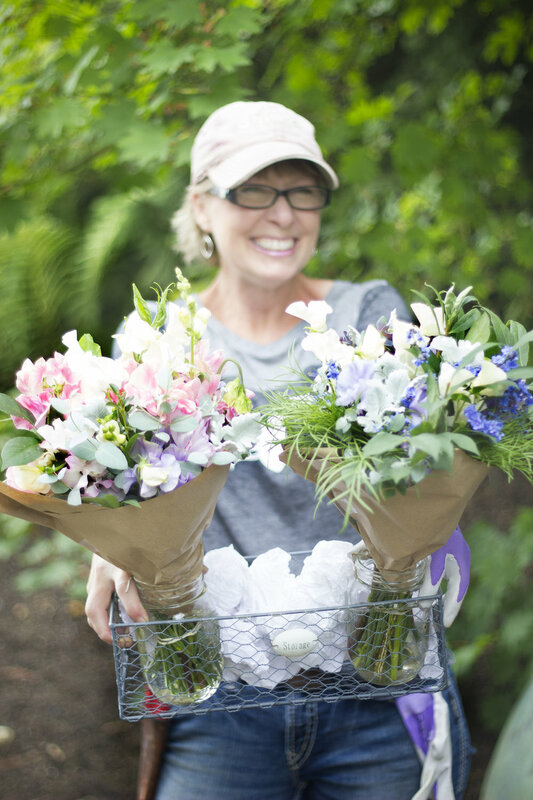 Gwen brings her passion for propagating, growing and creating to this facet of Pine Creek, providing fresh seasonal bouquets to Pine Creek customers, CSA bouquet subscribers and to Pine Creek Brides. Gwen’s style embraces the beauty that is found in many of the non-traditional florist flowers that grow in the PNW! Foraging is a passion, with clippers in hand, a walk through the property can bring fun and surprising ingredients to her creations. Scattered Seeds offers bouquet subscriptions through the growing season, starting with unique and beautiful spring bulbs starting in April, to the glorious and colorful dahlias starting in September! Bulk flower buckets are available to those who like to do their own creating! Whether it’s for an intimate dinner party, or a large wedding… we can provide you with blooms that are much fresher, and prettier than the staunch ‘run of the mill’ flowers found available in stores. Come see what beauty we have to offer to make your event stand out!